It is the data that provides the foundation of utilized information for vehicle. What is the vehicle catalog database (vehicle DB)? It collects data such as grade, standard equipment, options, value information, images, etc. for each model, and converts them into a DB. 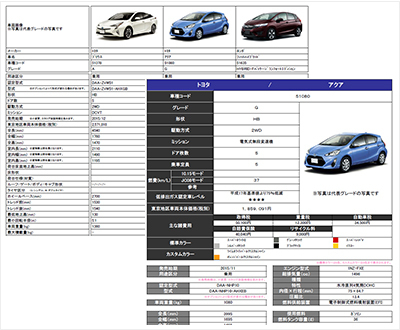 The vehicle DB has been created based on the catalog issued by the manufacturer, and it is possible to be utilized as the basis of vehicle information. Each vehicle model / grade is allocated for a specific code, and all categories, specifications, various tax amounts, option information, etc. are connected to the allocated code. Below are excerpts of general data items. We have many other besides this, please contact us if you would like to know more details. 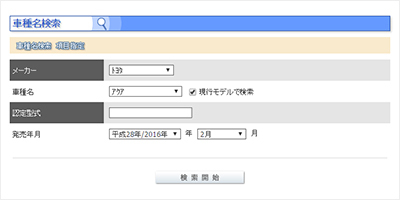 ・Model specification number · Classification division number ... By using these keys, it is possible to specify the vehicle and retrieve associated information. ・System can automatically judge whether the option is included in a set or is a combination that does not exist. *1　Some special edition vehicles is not provided. This table please swipe left or right. Around 130,000 grades are recorded, and an unique vehicle code is allocated for each car model. 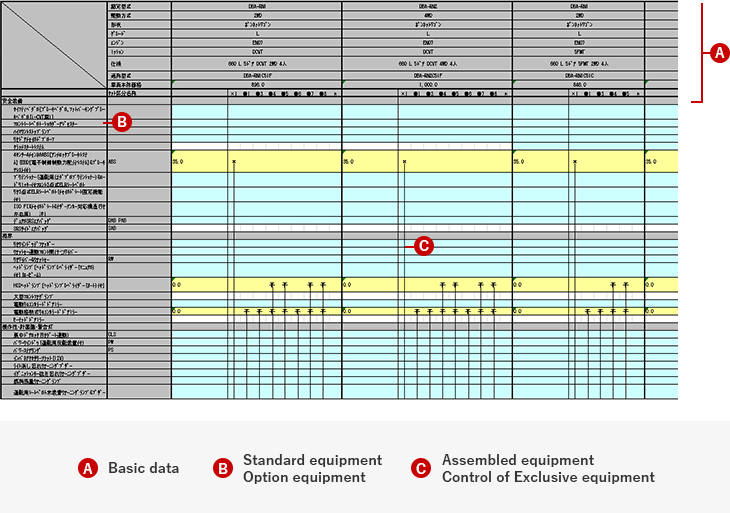 Each specific vehicle code is connected to its basic data (specification information etc.) and equipment data (body color, options, etc.). For various options, it is possible to distinguish manufacturer options, dealer options, etc. It is possible to let the system automatically judge the equipment to be a set or a combination that does not exist. We also manage the standard price of the vehicle, manufacturer option, dealer option equipment price, optional prices by body color. Possible to confirm vehicle, search information with the following keys. By using our vehicle DB as a master of enterprise system or EC site, it is not only more convenient for users but also provide foundation data for users' future analysis. For each vehicle, we manage the following information. You may use our vehicle DB as catalog data when you propose to your customers, or use it to display vehicle information on EC sites. Use as vehicle master for enterprise system. Use as foundation data for vehicle estimation system. 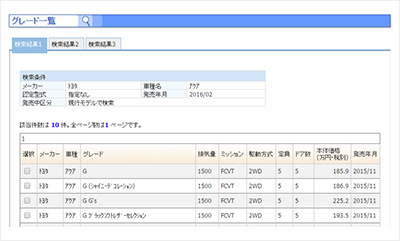 Utilize as vehicle specifying function for used vehicles purchase assessment system. The accumulated data may be used as basic data for analysis. There are various usage besides the above. We are also able to consult about how to utilize contents based on past examples. Our system package uses the vehicle DB as the basis of automobile information. As an example of utilization, we will introduce below.